Save the Date: Thursday, March 10th. ...and NOW, to find the perfect RED shoe! Celebrate Valentine's Day (with chocolate griddle cakes!) 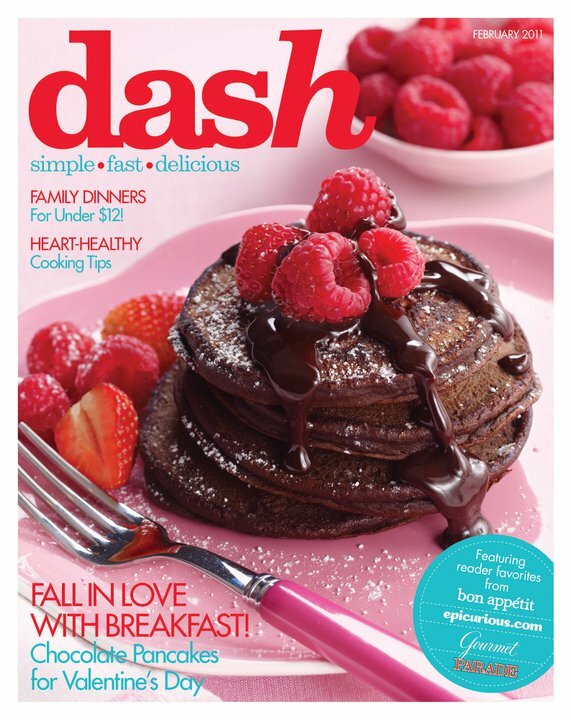 and American Heart Month (with delicious, healthy recipes) with dash! In addition to giving you sweets for your "sweetie", this issue marks the first collaboration with Condé Nast Publications' Bon Appétit, Epicurous.com and Gourmet Magazine. Be sure to check out http://www.dashrecipes.com/ SOON and register for the Giada De Laurentiis Bakeware giveaway (read: Almond Muffins) as well! New York - February 2011 -- The first official issue of dash, the new monthly food magazine from the publishers of PARADE, will begin monthly publication in your newspaper on or around February 9! This issue marks the celebration of matters of the heart with recipes that are simple, fast and delicious. Who said you shouldn’t eat dessert first? From chocolate pancakes to Mini King Cakes for Mardi Gras, desserts rule this Valentine’s Day! And our Good-for-You All-Stars, like salmon and broccoli, will satisfy those who want something both delicious and nutritious. Love It! A breakfast staple gets a Valentine’s makeover: Chocolate griddle cakes: Three delicious toppings will give this treat an even more lovin’ feeling, whether for couple time or kid-friendly fun (fruit slices, heavy cream and chocolate, ice cream). Olive Oil is “much more than a salad and sauce go-to. Flavorful new oils can now be used in your favorite baked goods,” says dash. Crisco’s Cooking Spray is ranked “best” for its even coverage. Also featured: Bertolli Classico, Lucini Extra Virgin and Annie’s Roasted Garlic Flavored. Check out our recipe for a “Quickie Vinaigrette”. Is there a real difference between salted and unsalted butter? What’s an easy, festive Oscar snack (sugar & spice popcorn!)? Are the benefits of whole grains the same whether cooked or raw? This Dessert Rules! Mini King Cakes—they’re a traditional Mardi Gras treat. A plastic trinket is slid inside after baking. Whoever finds it has to bring next year’s cake! Under the direction of PARADE Editor Maggie Murphy, dash aims to help readers get simple, fast, delicious meals on the table every day. dash blends original content with some of the most popular features from four of America’s most trusted food sources: Bon Appétit, Epicurous.com, Gourmet and PARADE. Celebrate with American Heart Association by supporting Go Red for Women and rocking your most fab, fly 'fit...in RED! On Friday, February 4th, "go red" for a GOOD cause. Be sure to RSVP via Facebook and tell five women to do the same! Hours of Operation:Friday 10:30 p.m. – 2:30 a.m.
Capacity:The 4,200 square foot space features seating for up to 250 guests, a 55-seat bar and a 600-square foot marble dance floor. There are also 4 private dining rooms that can accommodate up to 65 guests. Outdoor seating is available during the spring and summer, and can accommodate 40 guests. Beverages:The artisanal cocktail selection features seasonal, handcrafted drinks using specialty liquors and tinctures. A selection of craft bottled beers and a comprehensive Italian wine list round out the beverage menus. 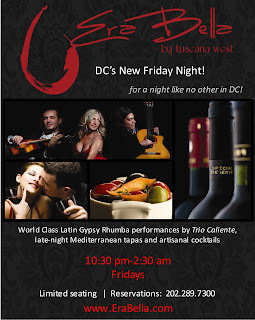 Entertainment:Highlighting the evening is the D.C. based group, Trio Caliente. Their inimitable sounds of gypsy rumba, latin jazz, flamenco pop, bossa and salsa have entertained such political luminaries as former President Bill Clinton, Supreme Court Justice Sonia Sotomayor, Secretary of State Condoleezza Rice and Senators John Kerry and Bob Dole. Their sounds have been enjoyed by notable Fortune 500 Companies and venerated international organizations, festivals and concert venues around the world. The groups recently released second album, features tracks with Grammy award winning artists. 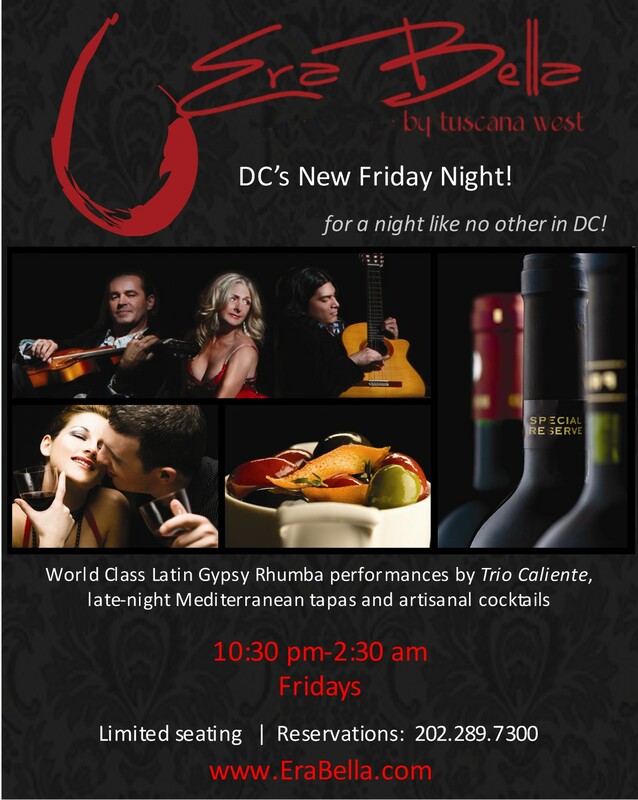 Reminiscent of The Gipsy Kings, Buena Vista Social Club and Jobim, Trio Caliente will provide sultry rhythms to accompany supper and dancing through the night. Credit Cards:Master Card, American Express and Visa. Metro:Half a block from the 14th Street exit of McPherson Square. Metro accessible on the Orange and Blue Lines. FOODIE. cupcake snob. mocktail maven. FRUGAL. cocktail connoisseur. social. AUNTIE. music fan. cineaste. VIRGO. mover. shaker. SWEETHEART. perfume pirate. blogger babe. **Appetizers, small plates and desserts! My Truth is FAR Stranger than Fiction! Happy Anniversary Denice & Willie! I'm Thankful . . . .
Just Throw it in The Bag (for $0.05)! Alas, you'll hear my voice. GET YOUR PURR ON THIS V-DAY! Ladi.Vee's Writer= Deliver Ear Wits.